About 7 or 8 years ago I started a blog called Green Bird of Happiness. I started it for several reasons, but the main one was to help me fight depression. I figured that it would be a good way to hold myself accountable to doing things that filled me up and gave me joy. I can’t quite recall how the name of that blog came to me, but once it arrived, the idea of little birds running around and doing things that brought them joy (and helped them to sing) never left me. I have a sketchbook filled with ideas for little birds and I had grand visions of filling my blog up with new little stories. 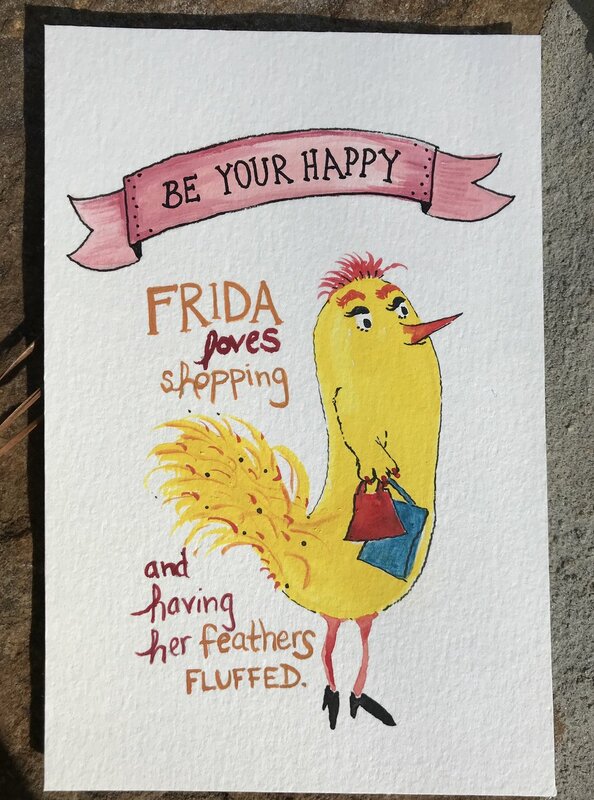 Frida, 2017. 4”x 6” gouache, acrylic and ink. As as I decided to give this art thing a try, those birds all came flying back to me. I tried to push them away. I couldn’t quite figure out how I was going to make money off of these little things. Well, I’ve decided that was a stupid idea. I can’t worry about what money does or doesn’t come. I have a line of birds a mile long waiting patiently to come to life in my head. I have also been pretty depressed over these past few months, and these little birds help. A lot. 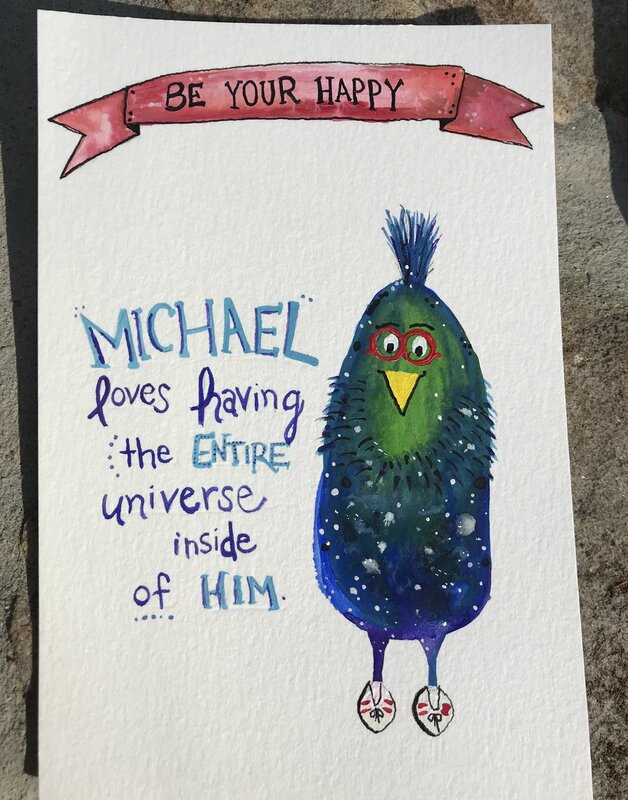 Michael is the Universe, 2017. 4” x 6” gouache, acrylic and ink. So, I’m going to focus on the birds. They bring me joy. And as selfish as that might sound - it’s just good mental and emotional health. When I’m feeling super low, I can’t give to my family or friends like I want. I have a hard time taking care of myself, but when I am working on these guys it’s not so hard to take a shower, or cook for my family, or have patience for my daughter. These birds are magic to me. They make me feel happy and then I become happier when I can care for my family and friends the way i want. Painting makes me happy. Here’s to being and giving more happiness. Jaime and his cigar, 2017. 4” x 6” gouache, acrylic and ink.